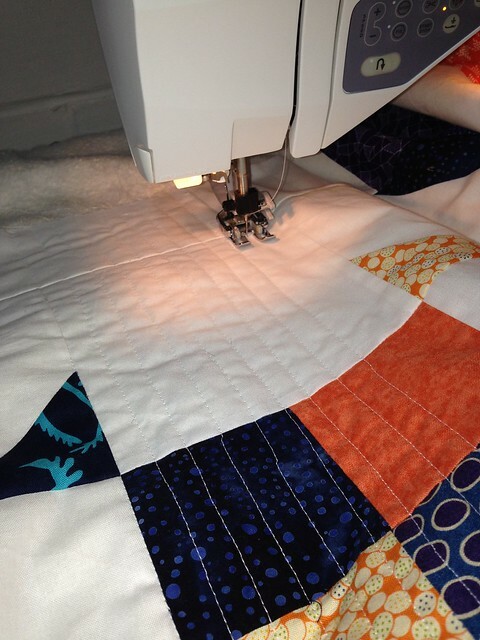 Straight lines are so boring to quilt. Looking forward to crossing something else off my list though. I allowed myself some time yesterday evening to cut out the pieces for my next couple of mini quilts that I will sew simultaneously, with one for the UK mini swap. Some times I find straight line quilting, especially on a quilt this size (72″ x 96″) hard going so it’s good to have something else I can switch to to rest my shoulders. Now that I’m about a third of the way through, I find the draw of finishing this more motivating than when I start to quilt, which is when I will find just about anything else to do instead. Hopefully there will be a finish this week.